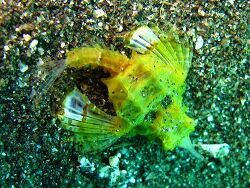 Sea-moth fish are unusual little critter and belong to the family „Pegasidae“ and are characterized by very large wing-like pectoral fins, which make them look like moths. They are found only in tropical Indian and West Pacific Oceans where they live mainly on sandy bottoms, crawling along using a pair of adapted pelvic fins. The family „Pegasidae“ currently consists of 6 Scecies, Pegasus volitans is a typical member of this family and reaches about 15 cm in length. 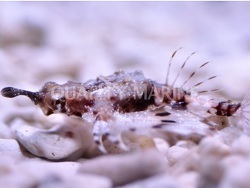 Sea-moth fish are rarely ever seen in the trade, and besides they are extremely difficult to maintain in captivity. They are timid creatures, and they spend most of their time scooting along the substrate in search of benthic invertebrates, their main diet. These fish should be considered somewhat delicate and should not be housed in a tank with fish that may cause it harm. They blend well with the substrate to avoid attention of predators. These fish should only be housed in well established tanks, and if a natural food source is not present, they may be supplemented with tigger pods and other similar foods.